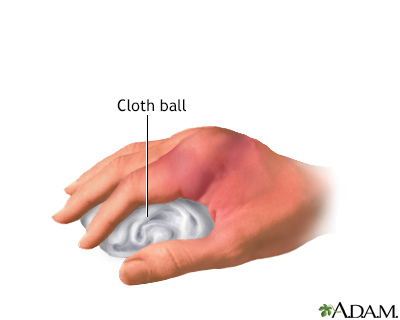 To begin making a hand dressing, place the injured hand around a cloth ball or other malleable (cushioned or padded) object, such as a tennis ball, balled-up sock, or rolled-up elastic bandage. 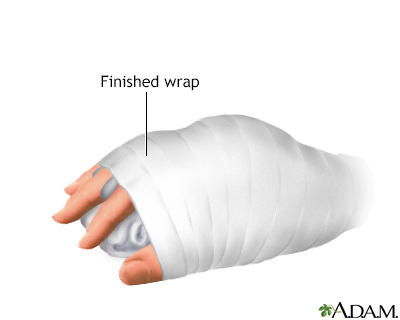 Use a cloth or rolled bandage to apply a circumferential wrap. Do not forget to place padding between the fingers. 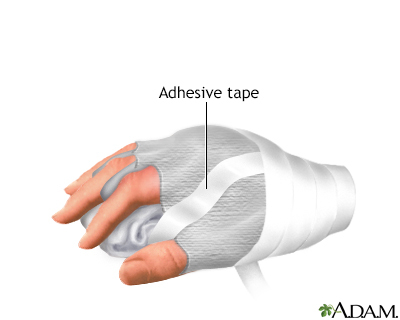 Use adhesive tape or a cloth strip to anchor the bandage and separate the fingers, as shown above. The complete wrap leaves the fingertips exposed, so that they can be checked for adequate circulation.